A recently published study in the journal Emerging Infectious Diseases says wild caught Alaskan salmon may harbor a species of tapeworm previously known to infect only Asian fish. Researchers warn that based on their findings, any salmon caught along the North American Pacific coast may have the parasite. The concern is that if you eat the fish undercooked or raw, you could become a host to this gruesome organism. Tapeworms, including the Japanese version can grow to 30 feet inside a human digestive tract. Infestation often goes undetected, because symptoms may often be mild, with symptoms largely attributed to other conditions by medical practitioners. When fish are commercially caught worldwide, they are placed on ice for the journey to port. But this does not freeze the fish, it only refrigerates them. To kill the possibly present parasite worms, the fish need to be frozen. 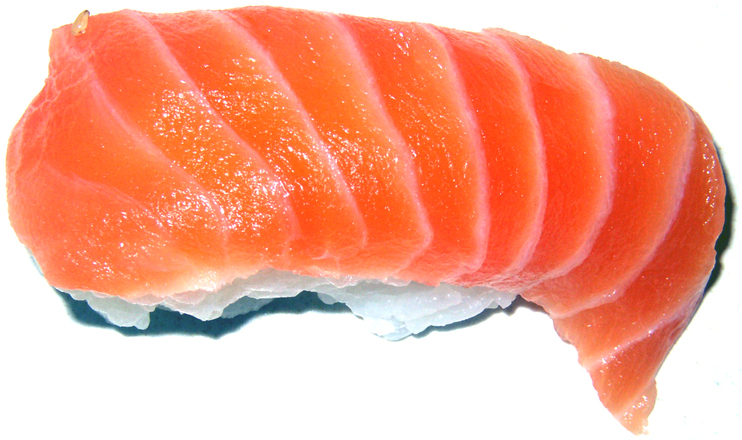 Salmon sushi at a restaurant or store can be assumed to be an unsafe commodity unless you know it has been frozen or you freeze it yourself. Additionally, the fish can be sufficiently cooked for assurance of safety against parasitic infection. Marijah says that symptoms caused by parasites include gas, diarrhea, chronic constipation, bloating, fatigue, skin rashes, mood swings, insomnia, nail biting, dry skin, weight gain, bad breath, brittle hair, hair loss, and muscle cramping. Because parasites can invade any tissue in the body, symptoms can occur anywhere. Dr. McCain states that parasites are a contributing factor in conditions such as Crohn’s disease, ulcerative colitis, diabetes, some heart disease, arthritis, asthma, as well as others. She points out that in the US, the medical system is in denial about the health risks of parasitic infections, and doctors make a huge blunder when they fail to recognize the role that parasites play in disease. “Parasites are the cause of hundreds of misdiagnosed ailments,” she claims, and recommends natural anti-parasite formulas in lieu of conventional toxic allopathic medications.